The picture is credited with encouraging millions of men to sign up to fight in the trenches, many of them never to return. But new research has found that no such poster was actually produced during the war and that the image was never used for official recruitment purposes. In fact, it only became popular and widely-used after the conflict ended. James Taylor, who has researched the history of recruitment posters, said the popular understanding of the design and the impact it had was almost entirely mistaken. “It’s widely believed to have been the most popular design of First World War, instrumental in recruiting millions of men. But the truth is: that simply wasn’t the case. It’s an urban myth,” he added. As part of his research, he studied the official records of the Parliamentary Recruiting Committee, the body responsible for recruitment posters, in the National Archives at Kew. 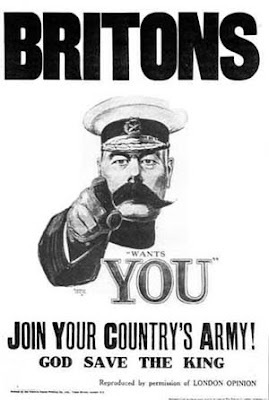 These documents provided details of the production of almost 200 official recruitment posters produced during the war and indicated which ones were deemed popular. The so-called ‘Your Country Needs You’ poster is absent. He also analysed thousands of photographs of street scenes and recruitment offices from the period in search of the image, again, without finding it. 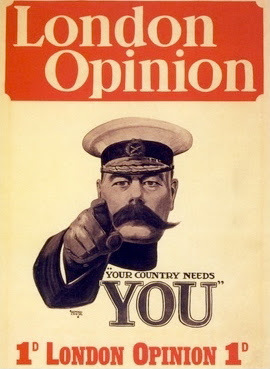 In his new book, Your Country Needs You, Mr Taylor traced the picture back to its origins, on 5th September 1914, barely a month after the start of the war. On that day, the image was used on the front cover of the popular magazine London Opinion, beneath the masthead, and alongside two promotional offers: “This paper insures you for £1,000” and “50 photographs of YOU for a shilling”. It had been designed by Alfred Leete, a graphic artist, who had adapted a portrait of Kitchener to give him the distinctive pointing finger. 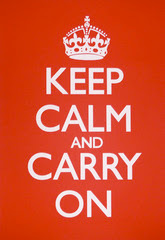 The slogan was adapted from the official call to arms, which said: “Your King and Country Need You”. In a subsequent edition, a week later, the magazine, which had a circulation of almost 300,000, said readers would be able to buy postcards of the image for 1s. 4d for 100. Despite this, Mr Taylor has not been able to track down any surviving examples in public or private collections, found that the original artwork for the magazine was acquired by the Imperial War Museum in 1917 and was mistakenly catalogued as part of the poster collection, contributing to later misunderstanding about its use. This 'myth' surrounding the poster echoes that around the “Keep Calm and Carry On” sign, which has been widely reproduced in recent years. That poster, designed in 1939, had limited distribution and no public display. Mr Taylor’s book shows how the Kitchener image did inspire similar posters, which were used, including one, which was produced by LO, with the word BRITONS, above the same picture of the Field Marshal pointing, with the words “wants YOU – Join Your Country’s Army!”, beneath, and the words ‘God Save The King’ printed along the bottom. However, Mr Taylor said there was no evidence the poster was particularly popular or a dominant design of the war, as some historians have claimed. The only occasion in which the image and the wording did appear in poster form was an elaborate design, when the words and picture appear, in a smaller scale, below five flags and surrounded by details or rates of pay and other information, including the additional slogan – “Your Country is Still Calling. Fighting Men! Fall In!!”. 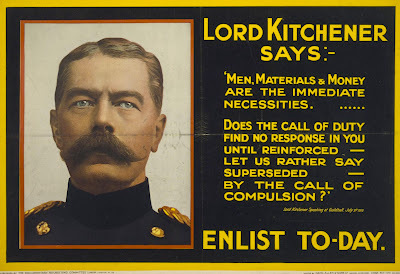 He found that the most popular poster of the era, in terms of numbers produced, did feature Kitchener, but without the pointing finger and featuring a 30-word extract from a speech he had made. Horatio Kitchener had been appointed Secretary of State for War at the outbreak of the conflict - the 99th anniversary of which is this weekend - and correctly predicted that victory would take several years and require huge new armies. He instigated a huge recruitment campaign to form “Kitchener’s Army”, or the “New Army” – whose men were later to die in campaigns such as the Somme. He was already the country’s most famous soldier, a recognisable and influential figure having served in a number of Imperial campaigns, including in the Sudan, and South Africa, during the Second Boer War. He died two years before the end of the First World War when he was travelling to Russia on a diplomatic mission, aboard the warship HMS Hampshire. The vessel struck a mine and sank west of the Orkney Islands. Kitchener, his staff, and 643 of the crew of 655 were drowned or died of exposure. Survivors who saw him in his final moments testified to his outward calm and resolution.